Posted November 24, 2014 in Uncategorized. When a writer or artist crafts a story, it is imperative that he or she properly sets the stage by creating a believable world for their characters to inhabit. One of the things that impressed me about Jack Kirby from the start was his ability to depict a realistic setting with just a few strategically placed objects and figures. 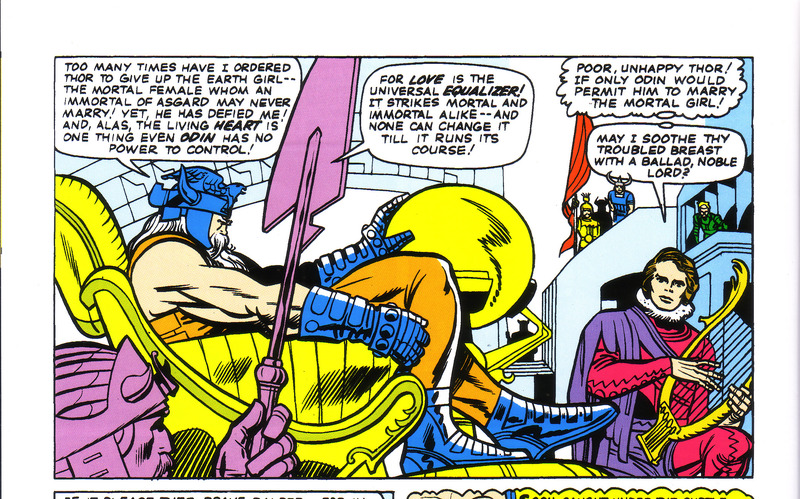 Kirby is rightly famous for creating a plethora of amazing fantasy worlds such as Thor’s homeland Asgard. This deceptively simple panel instantly establishes Odin’s regal prominence as well as the stately magnificence of Asgard with just a few shapes. The arch above Odin’s head serves not only as an architectural flourish but also frames the figure while sweeping the reader’s eye from left to right, counterbalancing the curvature of the monarch’s throne. The buildings on the right keep the eye from leaving the page but also contribute to the sense of majesty in the composition, as does the globe and harp that the musician is holding. The second image above is from Sgt. Fury #1, and perfectly establishes the tableau of men at war. 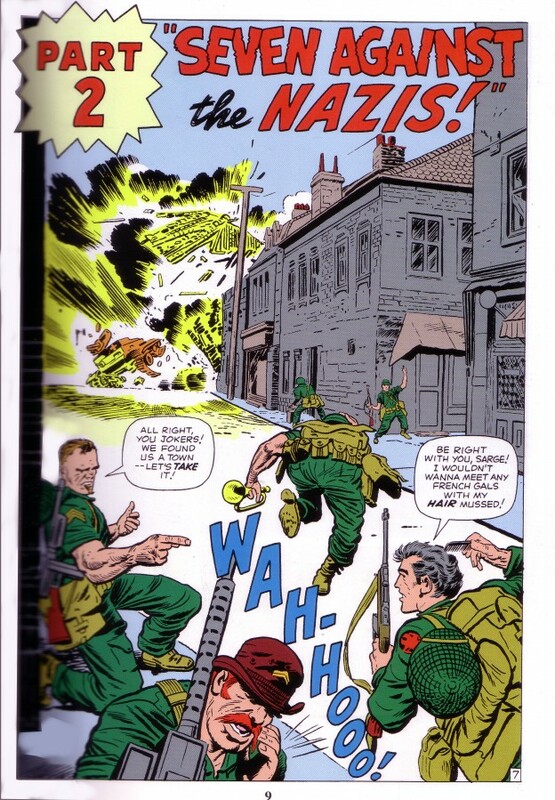 While a modern comic might show a group of steroid fed musclemen grimacing at the camera and showing how macho they can be, the Howling Commandos are in individual action and each occupy their own identity in a personal space/time continuum. Therefore, the reader actually has a sense of time passing as he or she parses the frame from left to right. The buildings receding into the background not only give us a sense of the specific environment but also contribute to that sense of time passing with motion in space. The placements of the figures within the coordinate grid of the structure reinforce that sense of space/time. Notice also that the Howlers move from left to right and then diagonally towards the explosion, intensifying it as the focus of the composition. 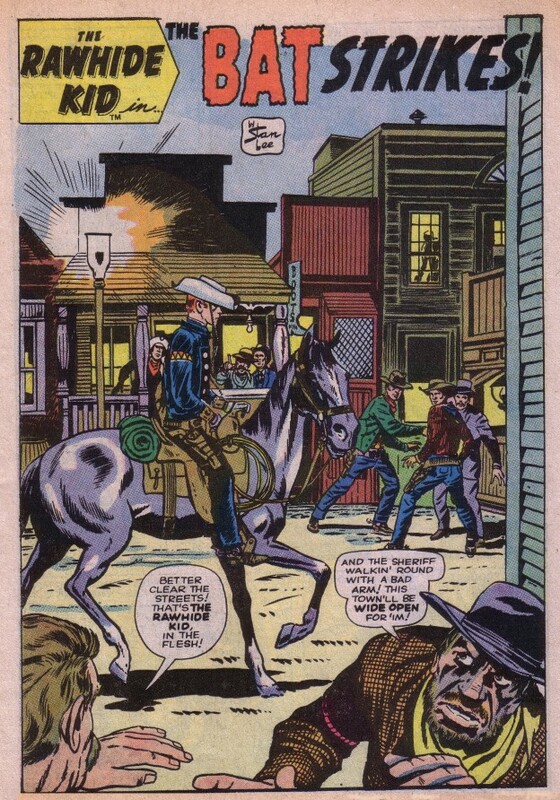 The final page above is from Rawhide Kid #25. The scene appears to be set at dusk, with the eerie gaslight cast at upper left, and the general ambiance is the paranoia besetting a provincial Western town. This sense of dread is also created by the hemmed in composition of buildings crowded together and figures shrinking back in fear. Given the story’s title, one expects to see a bat swoop down into the next panel, but sadly the foreshadowing of the splash panel is the most ominous and dramatic moment in a rather lackluster tale. Although Kirby is known best for his dynamic figures, one of the things that make him a master storyteller is his ability to create believable settings for his tales to unfold within. Always conscious of this necessity, Kirby knew just how little or how much information to include not only to propel the story but to create the desired ambiance. Good post, Norris. It’s remarkable what information Kirby conveys with the composition of a panel.